Metal Quotes provides real-time precious metals quotes directly to your iPhone or iPod touch. 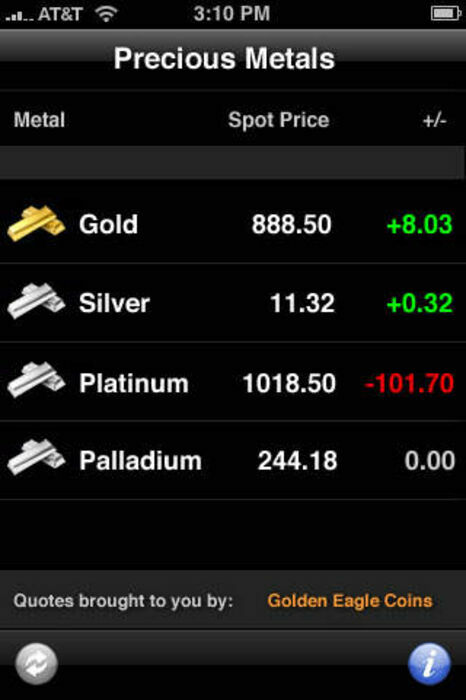 The application currently supports quotes for Gold, Silver, Platinum & Palladium. You can refresh quotes using the refresh button or select the automatic refresh interval that you wish for quotes. Metal Quotes derives it's quotes directly from the precious metals database at Golden Eagle Coins which comes directly from the US Commodities Exchange. The application also provides 24 hour quotes by accessing world markets when the US Markets are closed. 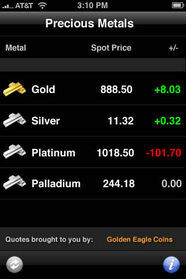 Metals Quotes 1.0 features the current Spot Gold Price, Silver Price, Platinum & Palladium Prices. Version 2.0 (coming soon) will feature charts, support for multiple currencies and languages and bid & ask information for each metal. Performance upgrades by code optimization. And changes in data source.